To make the Sichuan sauce, in a small frying pan toast the spices until fragrant, about 30 seconds. Remove and roughly grind in a mortar and pestle or spice grinder. Set aside. Dissolve the cornflour in 1 tablespoon water. Heat a large wok. Add the roasted chilli oil and sauté the ginger, chopped white spring onion parts and the garlic over medium heat until cooked, about 3 minutes. Add the pork and brown for about 4 minutes until crisp, breaking up the pieces. Add the soy, chilli flakes sediment, black vinegar, rice wine, cornflour water and toasted spices. Keep stir-frying until sticky and the sauce is thick. Remove from the heat. 2–3 minutes – they are done when they start to float to the top of the water. Drain and set aside. If using dried, boil for 6–7 minutes and then drain. Give them an extra rinse of hot water to remove any extra starch. Add the noodles to the sauce and stir-fry over medium heat using two long spoons. 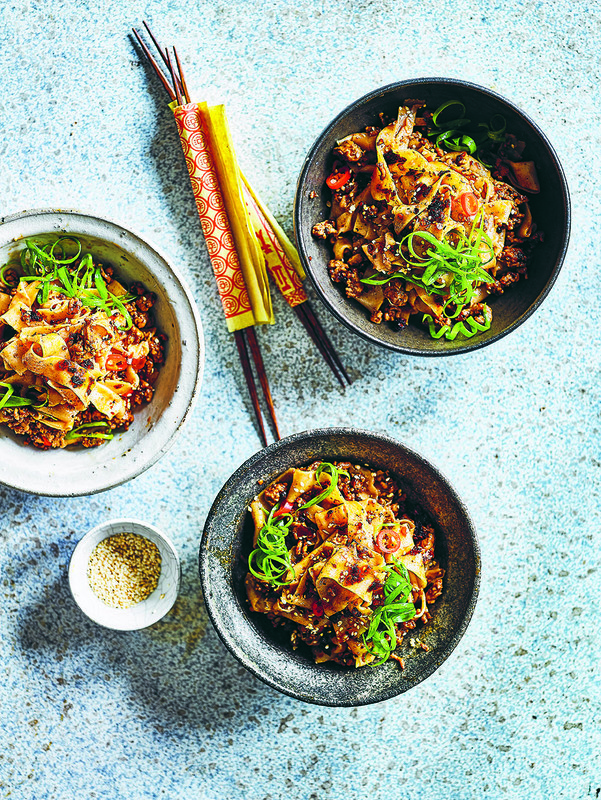 When everything is hot and sticky, pour into four large bowls and top with the chopped green parts of the spring onion, sliced red chilli and toasted sesame seeds. Warning – not all roasted chilli flakes in oil are created equal! Most Asian shops sell various brands of chilli oil or crispy chillies in oil, typically with the flakes, garlic and black beans (basically all the sludge) beneath the oil. My favourite brand is Lao Gan Ma, packaged in a red jar with a photo of a Chinese lady on the front (the name translates to ‘old lady’). It has a cult status around the world and once you’ve tried it, you might find yourself stockpiling extra jars in your cupboard. 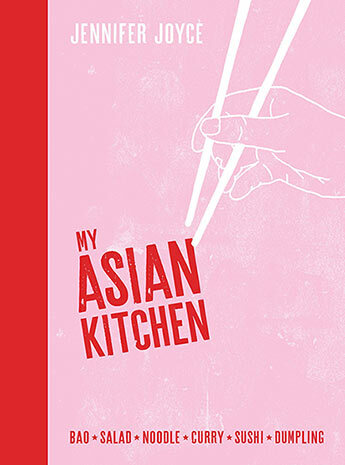 This entry was posted in Book supplied by publisher or author for review, Cook Books, Food and Drink, Recipes and tagged pork, rice noodles, soy sauce, udon noodles. Bookmark the permalink. Your very welcome Anne – do you like laksa? I have posted a recipe for a prawn one, but you can substitute chicken if that works for you.